Digboi, Assam, November 24, 2018: The seasoned Shamim Khan of Delhi seems to be making it a habit to prevail in playoff encounters at the Digboi Golf Links. 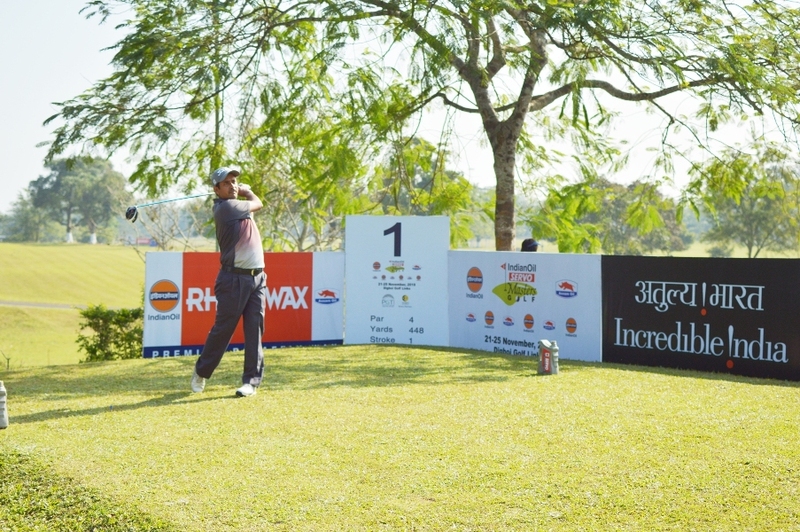 Shamim edged out Veer Ahlawat in a playoff last year and he repeated the feat for the second year in succession as he got the better of Noida’s Gaurav Pratap Singh on the third extra hole to retain the IndianOil Servo Masters Golf title on Saturday. Forty-year-old Shamim Khan (70-70-65-74) pocketed his third title in Digboi which also accounted for his overall 16th win after he clinched a nail-biting contest against 34-year-old Gaurav Pratap Singh (72-68-69-70) who took him into the playoff after the two golfers were tied at the top at nine-under-279 after the regulation 72 holes. Shamim Khan began the day as title favourite as he enjoyed a commanding four-shot lead after round three. Khan, the two-time and reigning PGTI Order of Merit champion, however slipped on the final day as his hitting and putting form deserted him resulting in four bogeys in exchange for two birdies. Nonetheless, Shamim used all his experience to hold on to his lead till the end. Gaurav Pratap Singh, four off the lead in tied second after day three, struggled in the first half of his final round as he was two-over till the 10th. But he then made a brave charge on the back-nine by stitching together five birdies and just one bogey on the last six holes. Gaurav, who won his only title on the PGTI nine years back, drove the green on the 14th and sank putts from a range of eight to 20 feet on the 13th, 17th and 18th to stretch the match into a playoff. In the playoff, the deadlock continued for the first two holes as both players made pars. On the decisive third extra hole, Gaurav missed his par putt from three feet while Shamim drained it from two feet to emerge champion. Shamim thus took home the winning cheque worth Rs. 7,27,425 to move up from 15th to eighth in the 2018 PGTI Order of Merit. Shamim said, “I feel the more experienced player always has the advantage in a playoff. In a playoff one also feels much less pressure if your ball is even slightly closer to the pin than your opponent’s. Both these factors worked in my favour today. “However, I feel the match actually swung in my favour when I made those five consecutive birdies late in the third round. That brought me back into the game from a hopeless position and really lifted my confidence,” added Khan, who was seven shots off the lead at the halfway stage. He further added, “This win comes as a huge relief for me as I’ve been struggling with an upper back injury since the start of the second half of the season. The injury has improved slightly but still gives me trouble. I’ve somehow played through it as the upper back isn’t much of a factor in golf. Chandigarh’s Harendra Gupta, who was also four behind the lead in tied second after round three, carded a 71 on day four to finish third at eight-under-280. Mukesh Kumar of Mhow, a six-time champion in Digboi, claimed fourth place at five-under-283 while Kolkata’s Shankar Das, a three-time winner, ended fifth and four-under-284.